What would it be like to have Christ come into the home of our heart? Moving from room to room with him, we discover what he desires for us. Are we prepared to meet with him daily in our living room? in our recreation room? in the study? What about that dark closet that needs cleaning out? These studies will take you through six of the rooms of your heart, helping you to see aspects of your Christian life as Jesus sees them. You will be stretched and enriched by your personal meetings with Christ in each study. 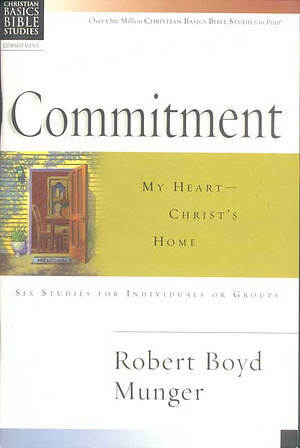 Christian Basics Bible Studies : Commitment by Robert Boyd Munger was published by Intervarsity Press in April 1994 and is our 8854th best seller. The ISBN for Christian Basics Bible Studies : Commitment is 9780851113418. Be the first to review Christian Basics Bible Studies : Commitment! Got a question? No problem! Just click here to ask us about Christian Basics Bible Studies : Commitment.